I’m not immune to trends and marketing. The floral bootie trend has been on my mind for about two years now. I do consider two years to be a decent wait time to ensure that I’m truly in love with something prior to purchasing. I bought these booties not long after Christmas when everyone feels they need to go out and buy the stuff they didn’t get in their stockings. Since we don’t exchange gifts that left the door wide open. I didn’t want other patterns to compete with the booties so I wore this very striped down version of a thrifted velvet boho style top and one of my handmade necklaces with some apparently so-not-cool-anymore skinny jeans. Maybe my not-so-svelte thighs and hips don’t mind that these jeans aren’t on trend anymore although I do find the heavier I get the less I like pants of any kind. Does a knee gap equal a thigh gap? Or do I get a prize for my thighs touching each other for a good six inches? Yesterday I went and got a pedicure. A pedicure in the middle of winter can only mean one thing…the beach! After being sick for well over two weeks now I can tell you I cannot wait to soak up some proper vitamin D.
We are off to an island in the South where there is very sketchy internet connection and a mandatory no blogging rule is strictly enforced. I’m busy packing now. So far my suitcase includes six dresses, a pair of shorts, a few t-shirts, three bathing suits, snorkelling gear and a couple of hats. I hope to have a post for you upon my return of what I’ve taken along to this getaway. I’m uploading books to my Kindle as well. It seems that vacation is the only time I manage to sit down and read a book, otherwise I’m always online reading. I’ll catch up with you some time later next week. The sun, sand and fish are calling my name. Ahhhh….have a fabulous time Suzanne! Being unconnected is probably the best thing for any of us! Your booties are truly fabulous! I love mine too, but I do wish they were a tad flatter. Not that I can’t walk in them, but they aren’t great for walking far distances. Oh well!! And let me tell you that you look great in your jeans! —But with those booties, who’s going to notice?? I’m craving a close up of your boots dear Suzanne! Two inch heal? Brocade or embroidery? They look great with your outfit which seems really versatile. A velvet jacket is certainly a garment that can be dressed up or down as needed. You certainly deserve a nice, island, getaway with your husband. I hope it’s a warm, joyous and reenergizing adventure for you both! So happy to hear you’re getting away to somewhere warm and nice. Enjoy! Hollies is right! We’d all enjoy seeing some of your vacation looks! I love the floral bootie trend, and you’re totally rocking it! 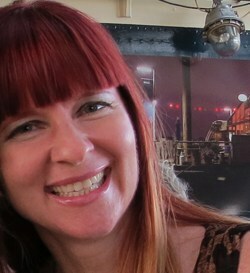 Have a fab time Suzanne! Yes, my boots are the same as yours – just different colours. They’re so cool and they look great. Glad your feeling better and floral boots are fab?. 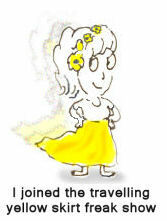 I told my hubby a tropical vacation is due next year as it has to beat this winter doldrums! Enjoy your time unplugged! I find it the only way to go on vacation! After two weeks of feeling like crap, I’m sure you are craving some sunshine and warmth. Have an excellent getaway. Lovely floral boots, glad you got them finally!, I’m also a huge fan of some ‘resting time’ before embracing any trend. And also do some excuses when buying something online! Wish you enjoy all those sand and sun and fishes!, as it looks like a perfect time!! besos & have a fab holiday! such fabulous booties, glad you got them finally!. They rock!! I’m also a huge fan of some ‘resting time’ before embracing any trend. And also do some excuses when I buy something online, sigh! Wish you enjoy all those fishes and sun and sand, it looks like a perfect time, even more perfect in the bleak midwinter! I had a pedicure two weeks ago, but I havn t seen a beach I months! Haha! I Love these boots! I put a beautiful pair on my Pinterest board! 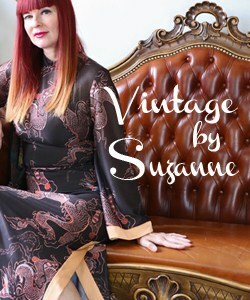 You are so right dear Suzanne, not jumping into the newest trend is the best! I must confess that I love everything floral and velvet, and I had some velvet shoes, but not boots – and I had to buy a pair, because, as I said, I love velvet. Same as for floral shoes – I have many, but not boots, so I bought a pair. I agree with you, they are so lovely, they needed a neutral outfit and you did it well – and look so beautiful! I am glad that you got better and will go to the beach, enjoy it a lot and not having internet is great – I hope you have a great time and come back with the batteries recharged! Bisous! I’m so happy for your vacation – I hope you have the most wonderful time! And I love the boots – I’ve been looking for something floral myself. Have a fabulous time! And, those boots are really great- your outfit looks so monochromatic, and then, surprise, you have patterned shoes! Glad to hear you’re getting over the flu and jetting off somewhere warm… I’m having the flu now (although I’m pretty sure I didn’t get it from you…) so I’m green with envy. About the booties… velvet sounds good and looks divine but how does it go with snow? Sleet? I very much like this look. You were right to keep everything else calm with those gorgous boots. So you, very boho. I hope you have a terrific holiday. 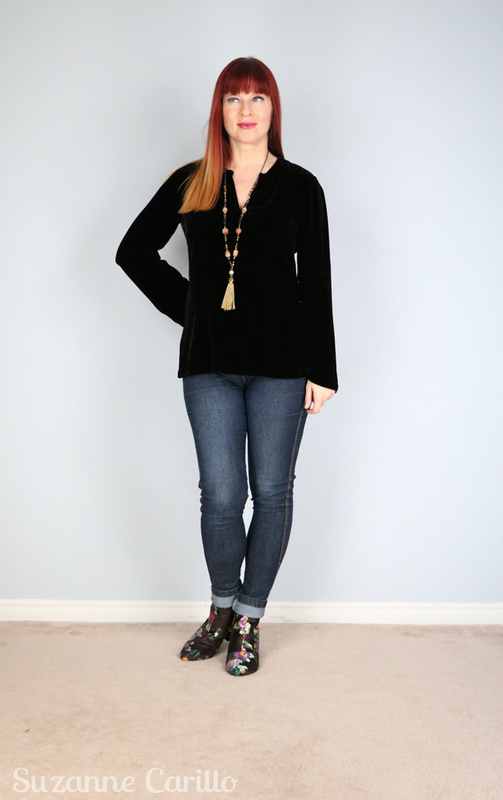 Love the jeans, trends or not, they fit and you look fantastic, The black velvet tunic is gorge, and the perfect setting for your necklace. he boots, you know I love them. and to the beach you go, I am so happy for you. Enjoy and re coup!